Infiniti just completed their annual Performance Engineering Academy trials and an American student took one of five global spots as an engineering intern for Formula One with the Infiniti Red Bull team. 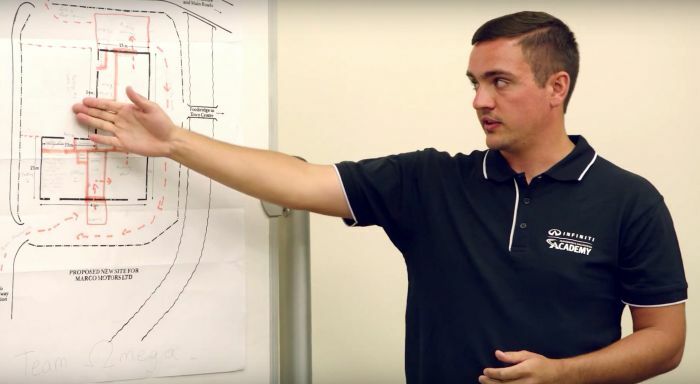 The 2015 Infiniti Performance Engineering Academy has selected five global winners from engineering students around the world competing for a spot in this year's internship program for Infiniti production and Formula One. The one-year internship is a paid position where the students get to work side-by-side with engineers and designers from the Infiniti team at both the factory and on the race track. Eleven finalists from the United States were up for the spot this year and Alex Allmandinger, pictured above, won out as the choice for this year's IPEA program. He will move to the Infiniti Red Bull Racing headquarters in the United Kingdom next month and begin his twelve-month working placement with the company. Four others from around the globe will join him. The students spend the year rotating through the Infiniti engineering departments where they'll work with mentors and others. Alex will spend eight months in Vehicle Design at the Infiniti Red Bull Racing headquarters in Milton Keynes, UK and the other four months at the Infiniti European Technical Center in Cranfield, UK working on road car development. The IPEA, now in its second year, is a one-of-a-kind global search for the world's best up-and-coming engineers. For 2015, five placements were made available with one winner chosen each from Russia, Western Europe, China, Saudi Arabia and the U.S. to work in roles spanning vehicle dynamics, vehicle design, aerodynamics and electronics. "It still hasn't sunk in, but I am incredibly excited about joining the Infiniti Performance Engineering Academy," said Allmandinger. "It really is a dream come true, and I can't wait to get started. It will be the best 12-month learning experience of my life."